Robert Cooper is a third generation distiller, entrepreneur and creator of liquor brands - best known for building/creating Chambord Raspberry Liqueur. Rob has been working on creating a high quality elderflower liqueur since 2002 when he realised what an important cocktail ingredient the non-alcoholic elderflower cordials were becoming in London. Handpicked small white blossoms from the French Alps where elder bushes grow abundantly were preferred for the maceration. Hungarian and Romanian gypsies trawl the mountain-sides to handpick the small white blossoms. St. Germain's packaging reflects the artisan nature of its production. 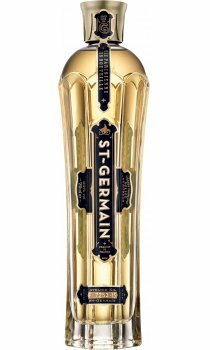 The shapely eight-sided bottle was created as a tribute to the vibrant art deco period in St. Germain. Each is finished with a heavy stopper and individually numbered and marked with the vintage year. Why the name? On his frequent trips to the Alps and distillery while developing the liqueur, Rob Cooper would fly in and out of Paris. On the way he fell in love with Saint-Germain-des-Pres and its cafes. Its o.k., however I found it too sweet to really work for me. I ended up using it sparingly in drinks, because of this. I first came across this delightful Elderflower liqueur on board the Celebrity Silhouette where they use it in their Blue Sea Breeze Cocktail - LOVELY. 2 parts Hendricks 1 blue curacao 1 St Germain elderflower 1/2 fresh lemon juice 1/2 simple sugar syrup lots of ice well shaken. TRY! The taste and perfume come through beautifully. In the bar, Take 5 Norwich, where I work as a waiter/barman a favourite use of this splendid drink is in Elderflower Martinis. The quickest way to heaven yet discovered. This is a wonderfully fragrant liqueur. Sip it by the thimbleful and you can savour the rich elderflower taste and scent at the back of your throat. Nothing quite like it. I just wish they would bottle the perfume! Absolutely fantastic! This is a remarkable liqueur, completely different from anything else I have tried, and I wish they would bottle the scent of it! What an amazing product. Beautiful packaging, a refreshing elderflower taste and absolutely delicious when mixed with white wine and tonic water. This featured in a cocktail booklet that came free in a national newspaper. What a discovery! Makes the most delicious cocktails - can't recommend it more highly. I came across this wonderful liqueur at the House and Garden Fair at Olympia, being sold by two young, very enthusiastic individuals. I tried the cocktail that they had made and thought it delicious. I then asked to try it on its own....amazing. I instantly bought three bottles! It is truly one of the best inventions of this decade! I told my 28yr old son about it and he instantly wanted some saying 'it will be good for the birds to drink. They always like something sweet'!! So, another happy customer. I am about to order a case to give away fro Xmas - and to drink! !